Bunny LOVES granola bars. 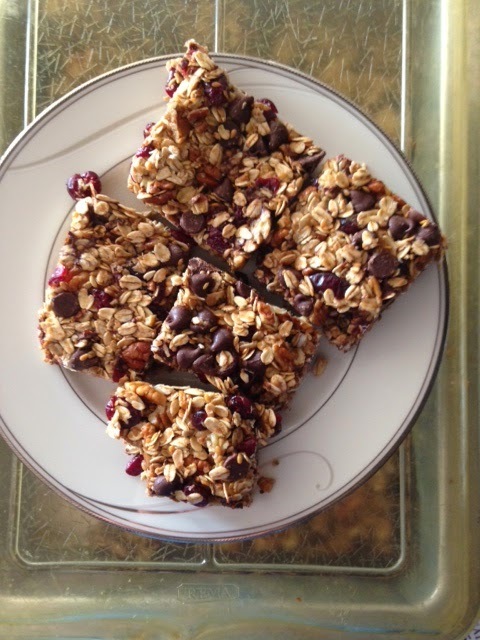 I had a ton of oats sitting in my cupboard so I decided to make some granola bars. They turned out AMAZING! My Love told me I was not allowed to make them again because they were so delicious he wanted to eat them all! They are fairly easy to make and taste amazing. Everyone is bound to like them. The best part is, they are 100% customizable! This recipe is easy to substitute your favorite things in. 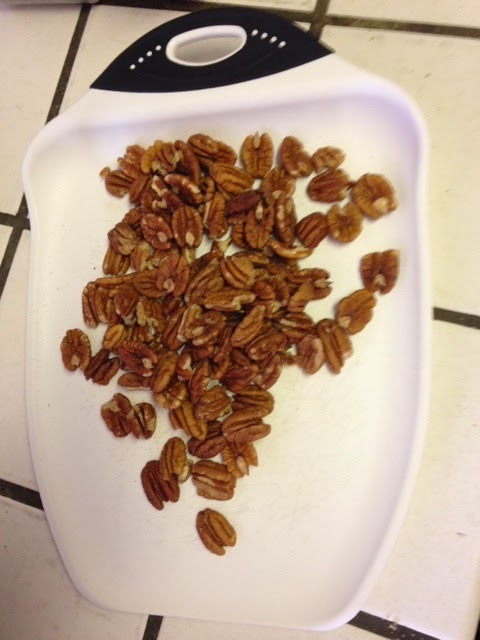 If you don’t like pecans, use any other nut! If you don’t like craisins, use any other dried fruit! If you don’t want dried fruit or nuts, don’t add them! I made one batch with butter and one without. I did not notice a big difference, using the butter is completely up to you! I prefer sea salt to table salt because sea salt can be bigger. I personally like getting a tiny chunk of salt in a bite, it makes the sweet sweeter. Wheat germ and flax seed are optional as well. Both have wonderful health benefits, and are great for boosting and maintaining milk supply for nursing moms. (They won’t hurt you if you are not nursing, nor will they induce lactation.) They are optional, the recipe will taste just as great without them! 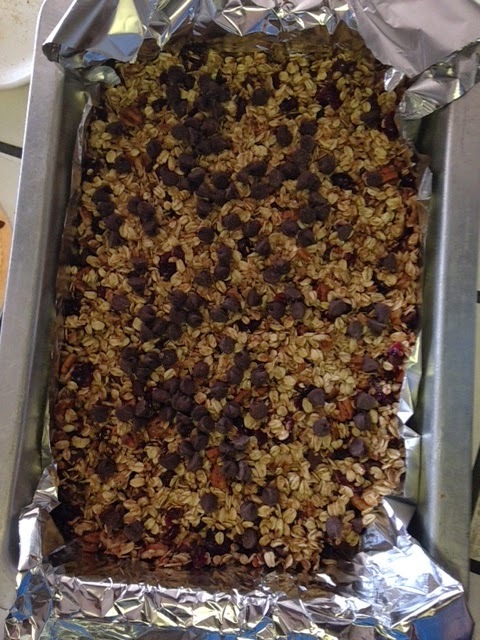 You can add less chocolate chips, or more, if you’d like! We make our own vanilla extract (AMAZING flavor), but if you don’t have homemade vanilla extract, try to use the real stuff, not the artificial flavoring. I like to use local honey, it tastes so much better in my opinion (I ran out of local honey for the photo and had to use my back up honey :). 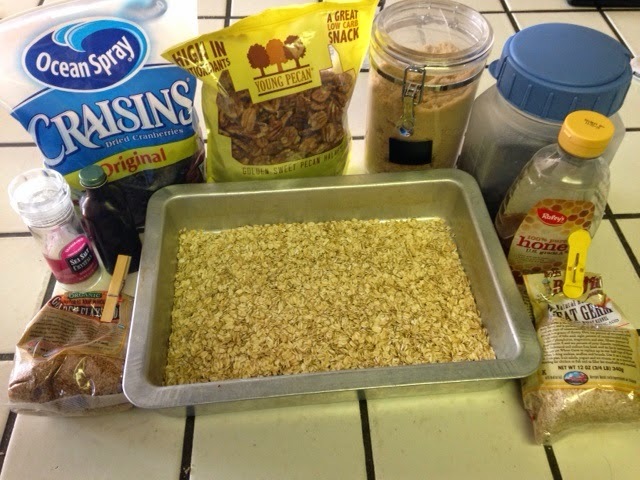 bake oats and wheat germ for 15 minutes, stirring once at 10 minutes. 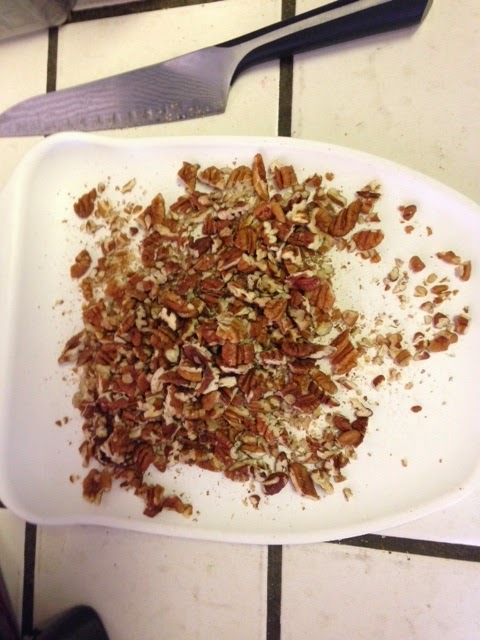 In a big bowl, combine flax seed, craisins, chopped pecans, and sea salt and set aside for later. Once you have stirred the oats and wheat germ at the 10 minute mark, combine butter, honey and brown sugar in a saucepan on the stove top on medium heat. Once the butter, honey and brown sugar are mixed together, add the vanilla extract. Stir often to keep the mixture from burning. 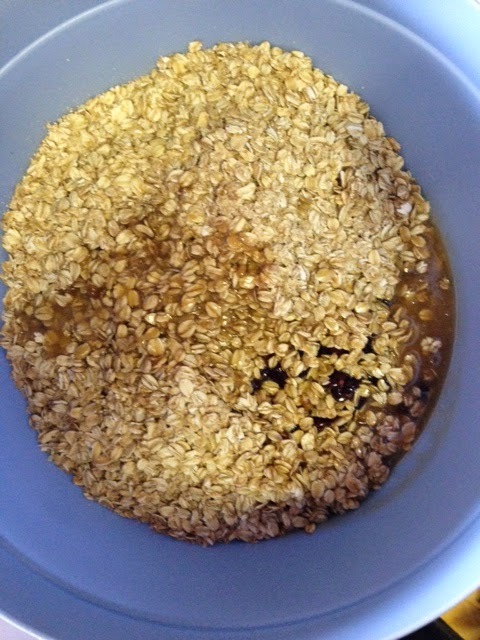 The oats and wheat germ should be done around the same time the butter, honey, brown sugar and vanilla extract are done. Pour the oats and wheat germ into the big bowl you set aside. No need to stir! Pour the butter, honey, brown sugar and vanilla extract combination into the big bowl and STIR! Stir until everything is coated in the butter, honey, brown sugar and vanilla extract mix. after it had been stirred, doesn’t it look yummy?!? While it is sitting, carefully place tin foil in the pan. This makes it easier to remove the granola bars. You can use a little non stick spray in the pan instead of tin foil. After 5 minutes, pour HALF of the chocolate chips into the bowl. This is important! The first time I made this, I did not wait the full 5 minutes AND I poured the entire cup of chocolate chips in the bowl. 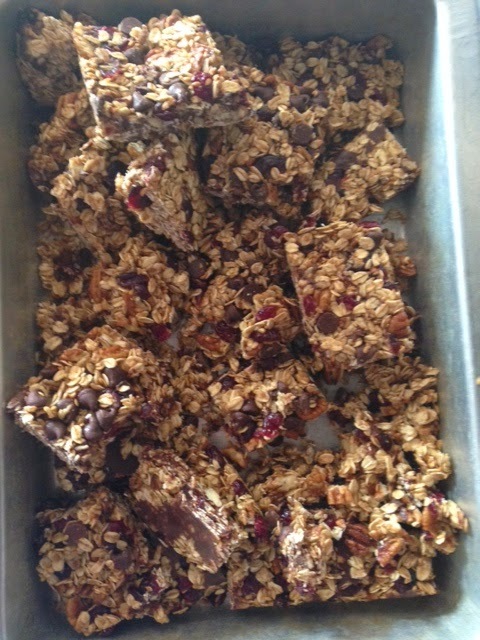 Most of the chips melted and I had melted chocolate all over my oat mixture! It tasted delicious but did not look quite as delicious. Stir in the chocolate chips. MMM add the chocolate chips! Once the chocolate chips are stirred in, pour the mixture into the pan. Wet your hands and firmly press the mixture into the pan. 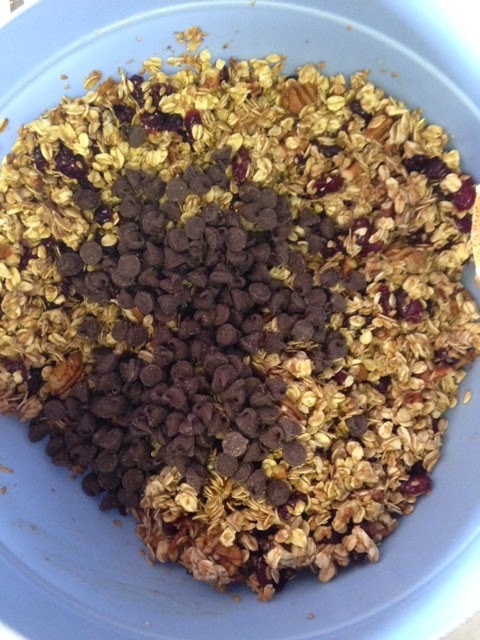 Sprinkle the rest of the chocolate chips on the granola and firmly press them in. 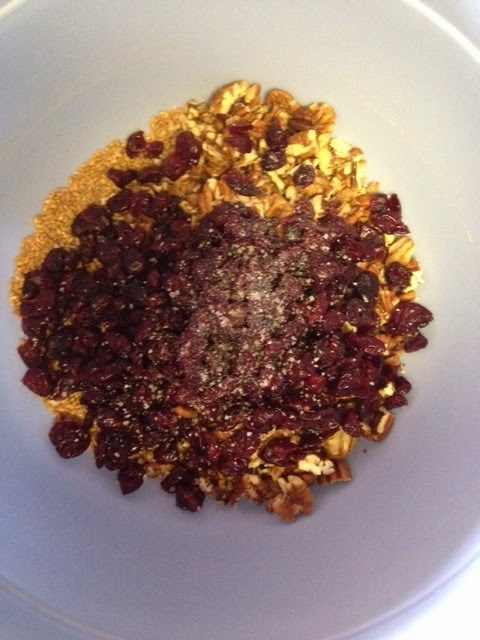 Continue to firmly press the granola for 2-3 minutes. The firmer you press, the more likely they are to stay in the form of a bar. 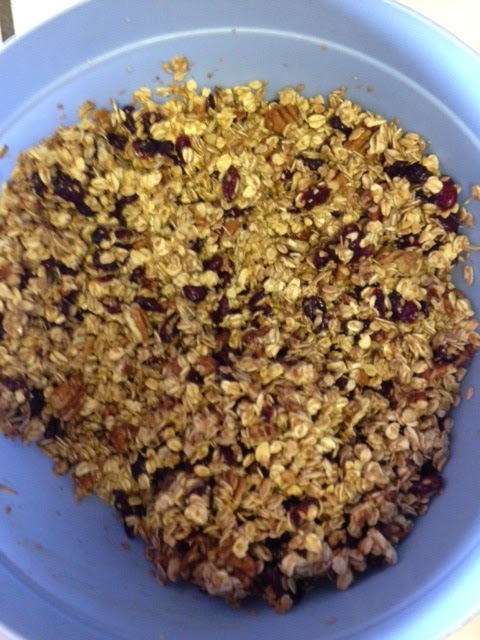 After you are done pressing the granola into the pan, let them sit for 2 hours. After 2 hours, cut, serve and enjoy! Some information about wheatgerm – Dr. Oz, good for baby, and health benefits. Some information about flax seed – health benefits, facts on flaxseed, for nursing moms.